it's about 3700 block of S. MLK in Bronzeville. I don't profess to be a fried chicken expert, but I lived in L.A. for a good stretch and developed a love for Scoe's Special. Here's hoping this place stacks up. Anybody have any info on whether it's the same ownership or a franchise or what? Secret? Keep Roscoe's opening in Chicago a secret? Shout it from the roof tops, this is really great news! While I'm certainly willing to give this place a fair chance, I'll remain skeptical that it can share anything more than Roscoe's name. Perhaps it's just my experience with the Evanston Hecky's BBQ and it's Chicago (franchised) location that is to blame. What's next, "Hot Doug's L.A."?! Admittedly, it would be pretty difficult to mess up chicken and waffles. they dont even share the name....notice the sign says "rosscoes"
busta312 wrote: they dont even share the name....notice the sign says "rosscoes"
And the chicken logo is different, too. Yes, it looks as if the Chicago restaurant will be an imitator. Here's hoping it's a good imitator! Parlor's waffles are top-notch but their chicken is overly breaded. It reminds me of "McDugels" (sp?) in the movie "Coming To America". There's actually a place by that name in Brooklyn. Has anyone driven by this place lately to see if it has opened? Even if it's not related to the original Roscoe's, it might be good. Fujisan wrote: Has anyone driven by this place lately to see if it has opened? The "light cream sauce" is onion gravy, which is optional, and adds an interesting, and tasty, dimension. Is there no place in the city for us to get C&W in the meantime? ndgbucktown wrote: Is there no place in the city for us to get C&W in the meantime? Parlor was mentioned earlier in the thread but not expanded upon. Doesn't Lagniappe have wings and waffles? Or am I misremembering? I believe Skykark on Halstead and Cermak has them on the menu. Do a search to find the exact address. I havent been there in a few years. gleam wrote: Doesn't Lagniappe have wings and waffles? Or am I misremembering? Technically they have Wangs and Waffles. Rene G wrote: This reminds me, I need to get back to Lagniappe soon. Chicken-and-waffle specialists seem to have a tough time in Chicago. Floyd’s Wangs and Thangs on E 79th closed a few years ago (I never tried it). Last year Eat ’em Up Chicken & Waffles bit the dust (it was not a good place). There’s a relatively new chicken-and-waffle spot, Antwon’s. If you don’t mind getting your chicken and waffles at a non-specialist, many of the soul food restaurants can take care of you. I think Army & Lou’s always has it on the menu and you could build your own combination at many others. atomicman wrote: I believe Skykark on Halstead and Cermak has them on the menu. Do a search to find the exact address. I havent been there in a few years. And the ever-present, incredibly thick cloud of cigarette smoke might add some nice flavor to the dish. As a long time fan of Roscoe's, I would recommend C'est Si Bon in Hyde Park. The waffles are fluffy and the chicken is crispy with some spice to it. It's not Roscoe's, but it is a decent stand-in. Reviving an old thread a year later... Did this place ever open and has anyone tried it? Drove by yesterday. 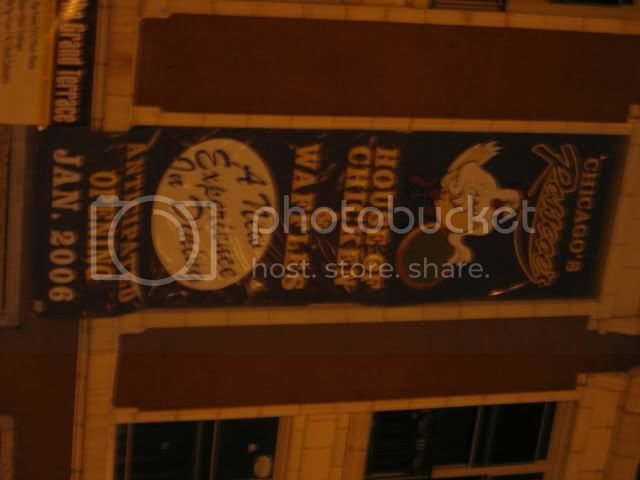 There is a sign hanging that now reads "Chicago Rosscoe's", but it still isn't open. The building looks complete, and there is a sign in the window of Rosscoe's saying the place is 30% sold. Not that I tried it- but yesterday- I did notice that The Grand Luxe Cafe at Michigan & Ontario does list Chicken and Waffles on its Menu. It’s not often you wait two and a half hours to eat for ten minutes. The persistent mass of humanity waiting patiently in the lobby on opening day at Rosscoe’s Chicken and Waffles made the weekend brunch crowds at Wishbone and Bongo Room look like fun. Based on crazy demand (the line rarely thinned out in the three hours we we’re at the restaurant), we’d venture, at least for today, that Rosscoe’s was probably hotter than Schwa or Alinea. Most of the patrons I spoke to were there because they thought this was the first Chicago outpost of the Los Angeles Roscoe’s chain. Chicago’s “Rosscoe’s” is not affiliated, though conversations between patrons and employees did nothing to dispel that myth. On two separate occasions, people told the manager, “We’re so happy you came from California”, and both times he responded, “We’re glad to be here.” We’re pretty sure, even with the alternate spelling, it’s only a matter of time before Roscoe’s slaps Rosscoe’s with a trademark infringement suit. The wait for a table was only about an hour and a half. But it took us another hour after we placed our order to receive our food. According to an employee, the point of service ordering system had gone down, and most likely frazzled by the chaos, two employees quit during the shift. Still, I’ve waited in line for over three hours to eat at the now defunct Uglesich’s in New Orleans, and the food justified every minute. That was not the case here. The waffles were tasty, but soggy and lacking any kind of golden exterior crunch. Eggs were overscrambled and our breast meat on one of the chicken pieces was dry. The homemade biscuits might have been good, but they had dried to hard tack by the time they reached our table. The Tonya Joi, or a mixture of fruit punch and lemonade may have been fresh (we didn’t get a chance to ask), but it tasted like Crystal Light and Country-Time and was way overpriced at $2.80. Our leg and our thigh pieces we’re juicy, and the spice profile, which has a bit of bite, though nothing like say Popeye’s spicy, was good. In fact, I’d take a plate of the chicken skin here anytime. The cheese grits were airy and lumpless, some of the best I’ve had locally. Also, the chicken livers, coated in the chicken spices were really good. Many places tend to overfry and dry them out, but these were spot on, and dipped in the waffle syrup, they were kind of like poor man’s foie gras. The good news is that Rosscoe’s has a takeout window. Next time I’ll use it. As long as I don’t have to wait two hours, I think the chicken, livers and grits are worth a repeat visit. The only chicken & waffles I've had in recent years was at Kitch'n on Roscoe last summer. It was OK, but I prefer actual pieces of chicken to a chicken breast. Man, how did chicken and waffles get all the food press in Chicago out on opening day? The mythic lure of something from LA shining its Tinseltown favor on our midwest podunk? Monica Eng has a piece too in which she says she was told three people in the kitchen quit during the first shift. Yeah, and you didn't immediately volunteer to work there to get the full story on what a gothic nightmare it must be back there? Where's your journalistic hunger for the story, huh? Overwhelmed by hunger for chicken and waffles? Ben Hecht would have announced that he was Dr. Felix von Egglehofer, the Viennese fried chicken master, happy to offer his services, just to get inside that Chamber of Horrors and get a scoop! That was when reporters were reporters and chickens were waffles! Meanwhile, if you want chicken and waffles and don't have four hours to spend waiting for them, they're right here. Mike G wrote: Meanwhile, if you want chicken and waffles and don't have four hours to spend waiting for them, they're right here. Alternatively, you can Do It Yourself at any restaurant with fried chicken and waffles as separate menu items. I can't speak for Monica, but I can tell you, I wasn't there because of anything from LA...I actually have no LA perspective with Roscoe's to speak of. I was just curious about a new spot promising what is a revelatory sweet and savory companionship when done right. Had I known it was going to take so long, I probably would have waited...but at some point, once I make the investment of time, I stick it out hard headedly 'til the end. It's probably some weird David Blaine style food lust gene I have...It definitely wasn't about tinseltown shining on midwest podunk or whatever...I hate coastal food coverage bias as much as anyone (though I would like an in-n-out burger here). There was no need to go back in to the kitchen, because you could see right in. It was a pretty straightforward story....relentless checks backed up on the pass, a deep fryer section unable to keep up with countless fried chicken orders, and a staff with no sense of how much a madhouse the first day would be. Frankly except for those shots of opening day at Krispy Kreme spots, I don't think I've seen much like it locally. If your heart wasn't in it, you would've quit too.